Vessel config files: Added tag "ClipRadius"
No new OVP commit. The current D3D9 beta client should still work. This commit has been designated as RC.4. Note that the old textures for the Jovian moons have been removed from SVN. You will have to download the RC.4 zip file to get the new ones. I've just updated my orbiter beta from the SVN repo. I assume that the differences between RC version and the release are cosmetic minimal. 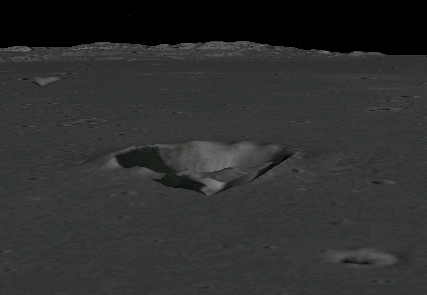 The front edge of the crater is transparent. This commit brings the SVN repository up to date to Orbiter release 2016. Bug fix: Vessel: global speed computation in InitLanded did not take into account surface elevation (resulting in spurious nonzero airspeed reading). Should fix this issue. Map MFD: now accepts OTARGET or BTARGET scenario tags for backward compatibility (preference is TARGET > OTARGET > BTARGET). Should fix this problem. Reduced minimum nearplane limit for internal views from 2.5m to 1m (in external views it is still 2.5m). Should fix this problem. Bug fix: pad auto-refuel is now working again. Should fix this problem. Atlantis: Zero RCS levels on deactivating the ascent autopilot [issue #1238]. Atlantis: Enable attachment jettison with J. Enable MMU with E. Should fix this problem. API: Force thruster level 0 on propellant disconnect. There is also a recent OVP commit that fixes point 1 in the D3D7 client. 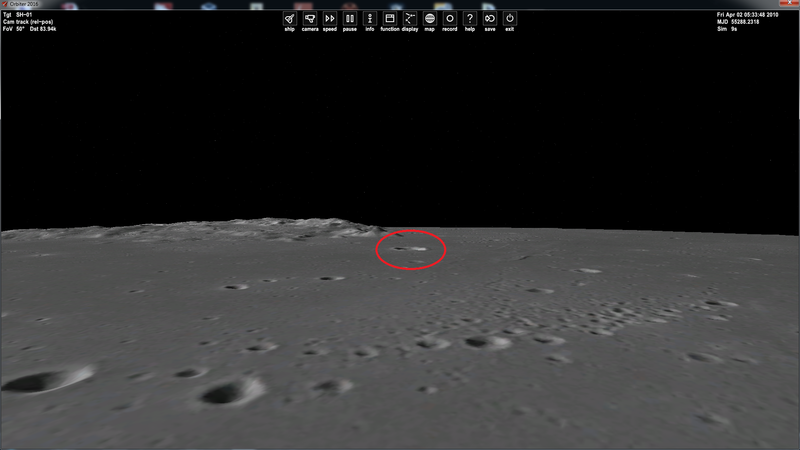 Could you please give the coordinates of that crater? Also could you point me to your report a year ago? I couldn't find it. Thanks! 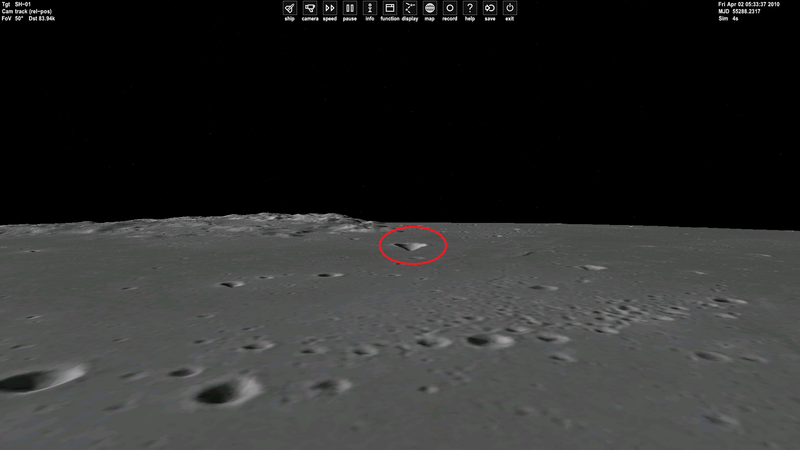 Actually this glith appears in every crater if you want to view it from low angle (like from very low (about 2-4 km) orbit around the moon), additionally Ive just now updated all files form SVN (to make sure the ghith was not fixed in RC or release version). 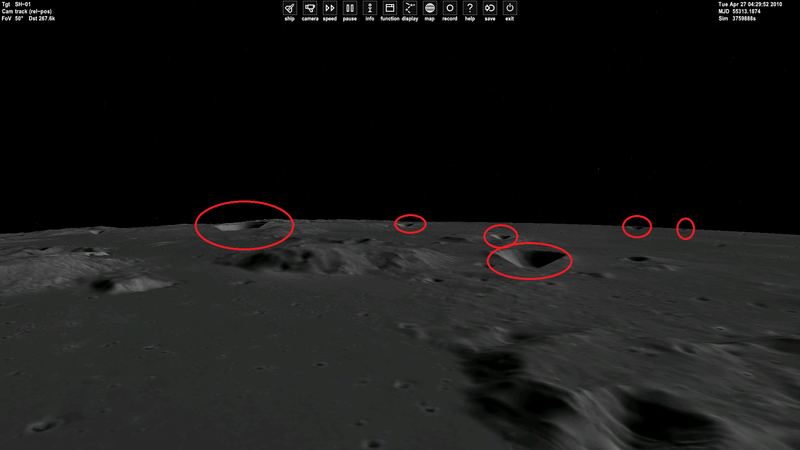 The craters are located next to brighton beach -> but it really doesnt matter becouse every crater is affected. The photos were made by zooming out from parked SH-01 at the pad on brighton. Over a year ago I mentioned about something else -> the atmospheric haze "gap" during ascent form hellas plantita on mars (terrain below "sea level" on mars) 3rd photo (as we can see this also appears in the newest version). I wanted to report about the crater issue but i was waiting for reply about the martian haze and Ive forgoten about the craters. Last edited by starcraftman; 08-30-2016 at 10:12 PM. I don't seem to be able to reproduce your problem. 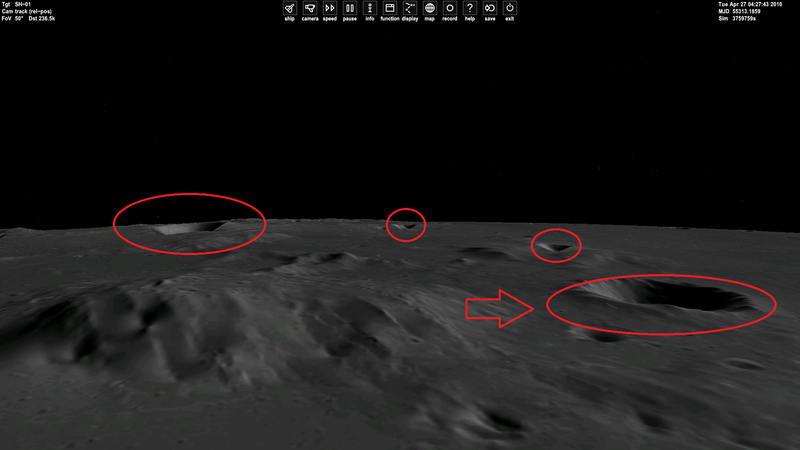 Since you didn't give a position or scenario I can't really try to match your images exactly, so here is another image with a few craters, plus the scenario to reproduce it. Do you get a different result? How long ago did you download the Moon textures? Regarding the Mars image, again, after a quick check I can't reproduce it, so it would really help if you could provide a scenario so I can see if the same problem is present here or not. Edit: ok, I can reproduce the atmosphere gap on Mars. Should be fixable. Ive used your scenario to create my view. On your image there arent any issues - on my there are. Maybe this is texture or elevation issue or graphic card settings. Edit: I know what is the reason -> Please notice that you are launched orbiter in window mode (I also tried and I noticet that there arent any glithes). Please try to launch orbiter full screen to reproduce the issue. Last edited by starcraftman; 08-31-2016 at 09:13 AM. Are you using a 32-bit framebuffer mode in fullscreen? 16-bit z-buffers are simply not sufficient for the dynamic ranges we need to cover. Unless you are really restricted by your graphics hardware, there shouldn't be a performance reason these days to use 16-bit modes. If that isn't it, then getting different results for window and fullscreen modes points to a driver issue. Maybe switching colour depth also affects resolution of z-buffer ? I have gtx970m so we can easily exclude hw limitation. Bug fix: VESSEL::GetStatus and VESSEL::GetStatusEx now respect the modified meaning of the arot and vrot vessel parameters for landed vessels (arot: rotation angles relative to planet frame, vrot.x: vessel CoG altitude above elevated ground). Should fix this problem. Bug fix: Log error message DDERR_BLTFASTCANTCLIP resolved. Should fix this problem. 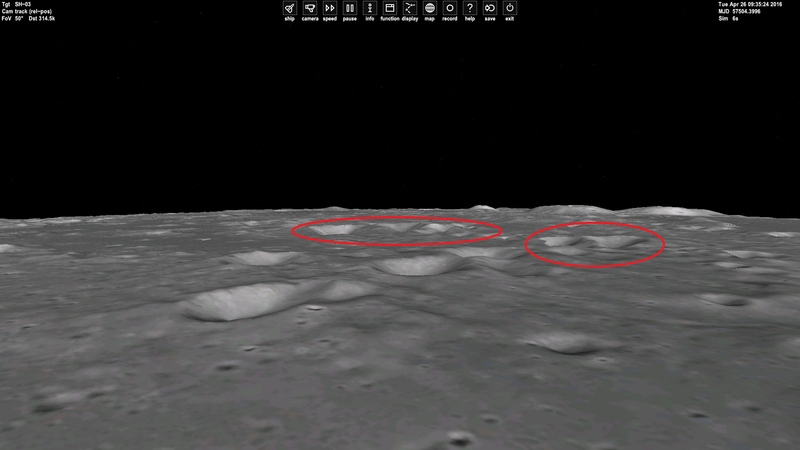 Bug fix: config texture dir now respected by new-style planetary texture and elevation maps. Addresses this problem, although the HTexDir value is still not being used. 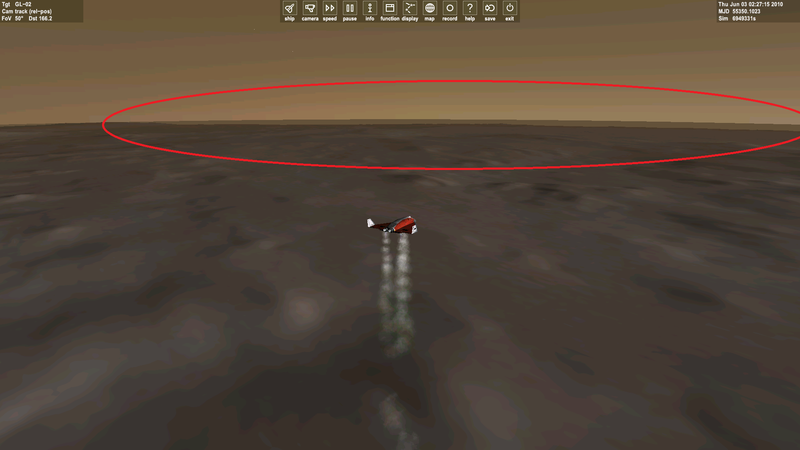 Bug fix: visual artefact with rendered horizon haze on Mars (lower edge visible from hellas plantita). Should fix this problem. There is also a new OVP commit (r. 55) to go with this. Will require graphics client recompile, and probably some edits to incorporate points 6 and 7. Thanks. Fixed it for me, as I can now re-use texture dirs without resorting to soft-links by means of setting the "TextureDir" property in the master configuration file. sorry, shall we commit to the repository or is the official link/mirror updated? Last edited by fred18; 09-03-2016 at 03:03 PM. Er, no. You should update (or checkout if you haven't done so before) from the repository. It is not recommended to check out into an existing Orbiter 2016 installation directory. But you can reuse the textures from your Orbiter 2016 installation, by modifying the TextureDir entry in Orbiter.cfg/Orbiter_ng.cfg. (what Face is talking about above). or is the official link/mirror updated? Not yet. It will be a while before the first patch is released. What if two textures folders exist. One in the original and one, for example in the SVN folder or test folder? I have the textures in my original Orbiter folder, i have also a copy of Orbiter for testing, without textures but linked with TextureDir=...\Textures\. In my test folder is now another textures folder with the textures for ISS. Planetary textures works ok but not the textures of ISS. Does Orbiter ignore the textures im my testing folder? Last edited by Jordan; 09-04-2016 at 07:35 PM. I think that's logical, because you've redirected the textures folder to your original install, where you did not install the ISS textures.